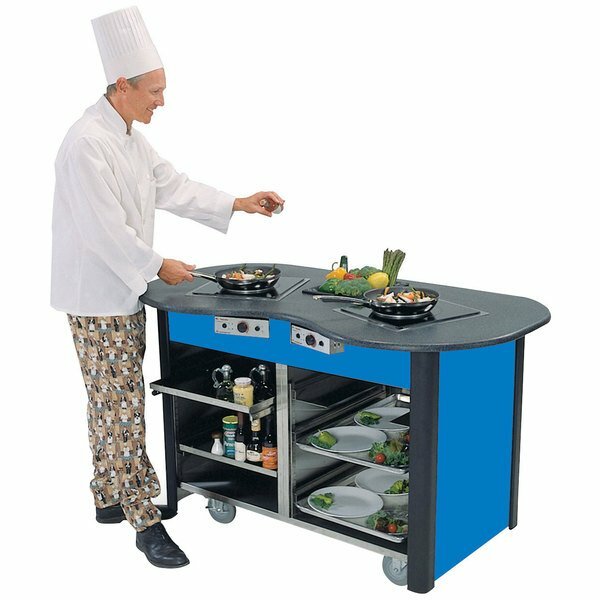 Lakeside 3070 Creation Station Mobile Stainless Steel Induction Cooking Cart with Royal Blue Laminate Finish - 32" x 60" x 35 3/4"
The Creation Station is very versatile for your imagination and creativity, that's what I like about it. The unit's very versatile. You can change things on it. You can put a cold well in there and you can create a stir fry station. The induction units are awesome in there to be able to create that. So, I mean, it's also mobile so you can move it around to wherever you need to be creative. The height of it is awesome because it's like a stainless steel kitchen table in a commercial kitchen. You don't have to bend over so much at a banquet table where you can stand straight up and do your cutting and still face the audience or the guests that you're serving. 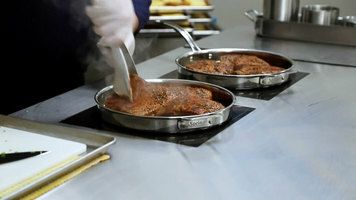 Plenty of room as far as for your prep and cutting and then also the sauteing from the induction units. The past few days we created an Asian grilled chicken breast with an Asian noodle salad. We took the chicken and seared it off in the grill pan that was induction ready and got some nice sear marks on there and grill marks. And then you have your cold area where you prepare the noodle salad, and you just put it right together so very versatile to use that. Lakeside's Creation Station is a versatile piece of equipment that can be customized to fit the specific needs of your display or mobile cooking application! Watch this video to hear from a real chef about the benefits of this unit. Creating a memorable, interactive dining atmosphere is easy with this Lakeside 3070 Creation Station® mobile stainless steel induction cooking cart with a royal blue laminate finish! Thanks to two energy efficient 120V, 1800W induction burners, this cart allows you to saute vegetables, brown meat, and rethermalize made-to-order pasta dishes right in front of your guests without the danger of an open flame. This unit's solid resin top is heat-resistant and comes with a built-in 10" x 12" x 6" bin with eutectic refrigeration to keep perishable ingredients right at your fingertips, while its lower cabinet is constructed of durable stainless steel for easy cleaning. Plus, its royal blue laminate finish gives it a polished, professional look that will fit in with your existing decor! This unit's mobile design allows it to be moved to different locations around your business to bring cooking demonstrations right to your customers! It has several interior features that make its bottom cabinet customizable to your individual needs, including two 18 1/2" x 23" height-adjustable, removable pull-out shelves. Three sets of 5 1/2" wide universal ledges are height-adjustable and can also be used to accommodate sheet pans, full size steam table pans, and plastic food boxes for convenient storage. With four 5" Lake-Glide® swivel, non-marking cushion tread casters, two with brakes, this unit is easy to maneuver throughout your hotel, upscale buffet, or college dining hall. This cooking cart requires a 120V electrical connection and has an output of 1800W. A separate 20 amp circuit is required for each burner, which can reach temperatures of 90-440 degrees Fahrenheit.